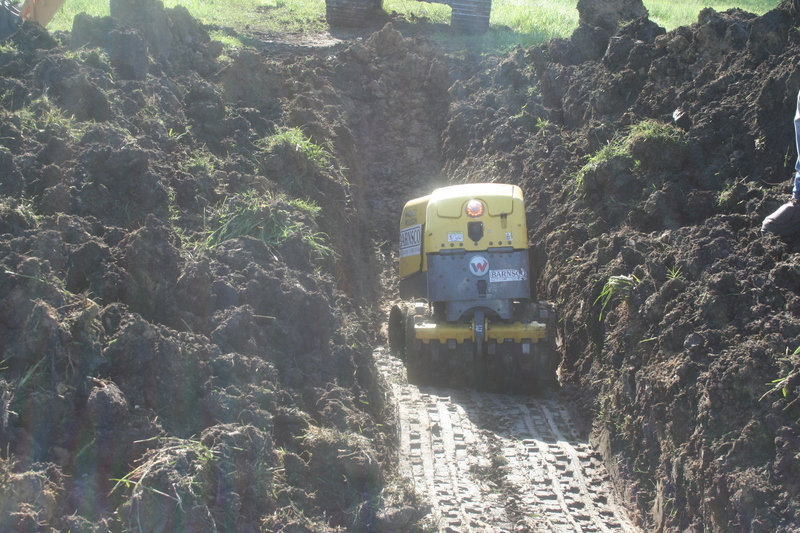 With a trench roller, dirt can be removed with a track-hoe, and refilled with a loader. The proverbial contractor field test. There are always a lot of new things to learn in the dirt business. Those often turn into life lessons. A few years ago, while working on a lake that would not hold water, the idea to dig a trench around the whole water line and fill it with clay was tossed around. This lake was 15 surface acres and seemed like a couple of miles around, way too much to economically dig a trench, backfill, and compact with big equipment. After a couple of days of head scratching and idea tossing, it was decided to see if, and how, this could be done. First, there are several rules. The material needs to be good for holding water, and the trench would need to be cut deep enough to stop water from going under the dam or laterally, and the material would have to be processed and efficiently compacted in the trench. Material in this lake site was good clay, or the project would not have been started. All the regular tests engineers want were performed. Before dirt samples were sent to a laboratory, it had the famous contractor field test done, and it all looked good. 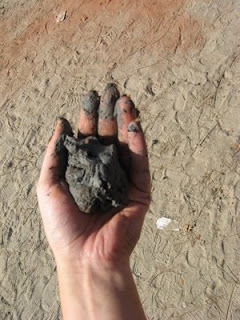 Moist clay would roll into threads without crumbling. The lake would not have been originally built if the material had not been any good. Knowing the material was good only added to the mystery of why the lake lost so much water. A few test holes were dug around the shoreline to determine how deep the trench would need to be, and whether it would need to be dug around the whole lake. This place was a giant puzzle, lots of good clay, but in some locations around the lake the material seemed to be placed in layers. The seams were not visible at all during construction. The equipment would always cut from one layer to the next without any way to notice any sort of change of material. We had good dirt, and a good game plan. Now we were ready for the actual work. A trench around this lake wide enough to get big equipment in would require a lot of dirt to be moved out and then back in, so money was the next problem. This project was much too far along to quit now. The finished dam took fifty thousand cubic yards of dirt to build. The dock was half-finished, and the water well had been completed. The grass had been planted, and fish had been ordered. How do we get a trench around the lake to help solve the problem and not have to get a second job to pay for it? The question was answered by asking a lot of smart people what they thought. Pipeline people gave us the answer we needed. The trench roller. It looks like a toy, but works like an ancient-time Roman military man. This little giant was designed to compact dirt in a small area where it was not practical (costs too much money) to use the big boys. It weighs about four thousand pounds, is three feet tall and three feet wide. The little work horse is powered by a diesel engine and bounces around like a regular sheep-foot roller or an Egyptian dancer from back in the day. Driven like a twenty-first century drone, it is controlled remotely from a distance of 20 feet. Normally, in my world, a trench is excavated with a dozer or a scraper, and dirt is placed back the same way. Compaction is done with either the scraper or the sheepsfoot roller—lots of men, machines, and money. 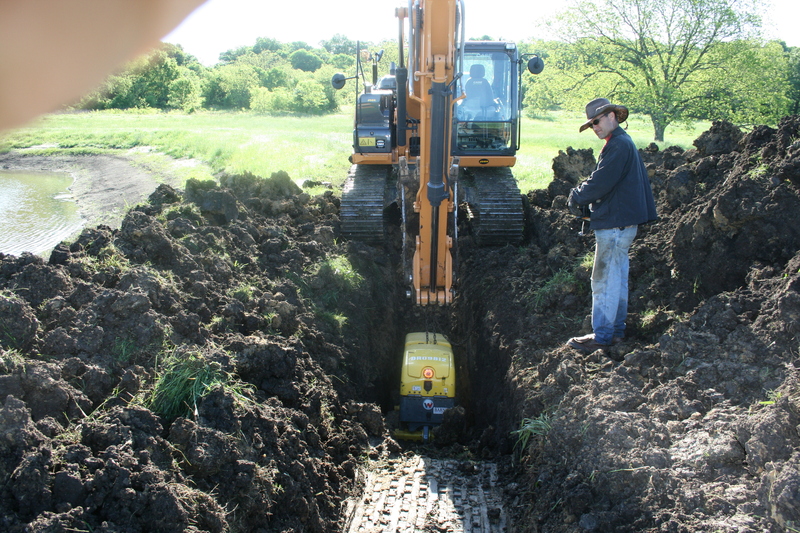 With a trench roller, dirt can be removed with a track-hoe, and refilled with a loader. The trench roller will do the dirty work, with the operator sitting in a lawn chair. The volume of dirt removed from the trench was cut by two-thirds, as was the amount of dirt going back into the trench. The overall price was also cut by more than two thirds, because the equipment and technique used cost thousands of dollars instead of hundreds of thousands of dollars. Here’s another key point. Without men below ground, safety was not an issue. The work was completed faster and at a lot less cost. The lake was trenched all the way around, back-filled, and packed. The dock was finished, the water well turned on, and fish were delivered. The water level still does not stay full all the time, but it is much better than before. Lots of lakes have a similar problem with water escaping. Old dams are likely to have been neglected, and trees are growing on the front or back slope. Roots from trees go to water, and cause small paths for water to tunnel out. Not a good situation at all, but not bad enough to tear the dam down and start over. This is a perfect place to but our new little tool to work. Another situation where this idea works well is on dams recently enlarged. I got a call from a worried fisherman who had his dam enlarged. In the past it held water fairly well, but now there is a stream of water coming out the back. Foundation seepage. In the past, if the flow weren’t too bad, we’d live with it because of the amount of work it would take to fix the problem. Not today. A small level bench was cut for the track hoe to sit, and off we go. This dam was built out of good material, so the same dirt that came out of the trench was put right back in. The track hoe cut a little deeper into the native ground and cut off the seam. It was not perfect, but it made a lot of difference in the amount of water loss and the amount of money needed to fix it—all because of this little compacting machine. One other key bit of advice. This is not a do-it-yourself project. There are lots of things that can go wrong, especially with moving water and very wet dirt. Some dirt moving experience is a must for this type of work. This trenching method has been used with water in the lake, as well as when the lake level was low. Believe me, it works a lot better without the water to worry about. Water is always moving and will find the path of least resistance. The trench will almost always act like a magnet and draw water in. There may not be much time to get the dirt out, back in, and compacted before the material turns to mud that cannot be compacted. This small machine does big work. Common sense and the safety people will not allow a trench to be unsafe to work around. This means it cannot be too deep with walls cut straight up and down. Dirt will not stand up like a metal building for very long, it will cave in. Let me say that again it will ALWAYS cave in. Newspapers and cable TV are filled with stories about collapsed trenches and people buried. Work needs to be completed as safely and quickly as possible. The trench packer takes a lot of the worry out of a job that could be dangerous. First, there is not a worker in the hole that could be covered up. Second, it is easy to get the roller out of trouble, especially the second time. They say we learn from our mistakes. That is especially true when the roller is covered with dirt a time or two. Placing dirt back in a narrow trench with a trackhoe must be done the same as it is done out in the open—as evenly as possible and in shallow layers. Operators must be on the ball all the time. Time and cost will decrease with a man in the seat that has a lot of experience at the controls. Recently a repair job was started where material used to build the dam was less than desirable. It was all that was available, so it was used. In the beginning it looked like a layer of bentonite would need to be applied to the front slope of the dam, spread out, tilled in, and then prayed for. As the work unfolded it became clear it would be better to try the trench method. A level bench was cut for the equipment to sit on, the trench was dug in sections of about twenty feet long. 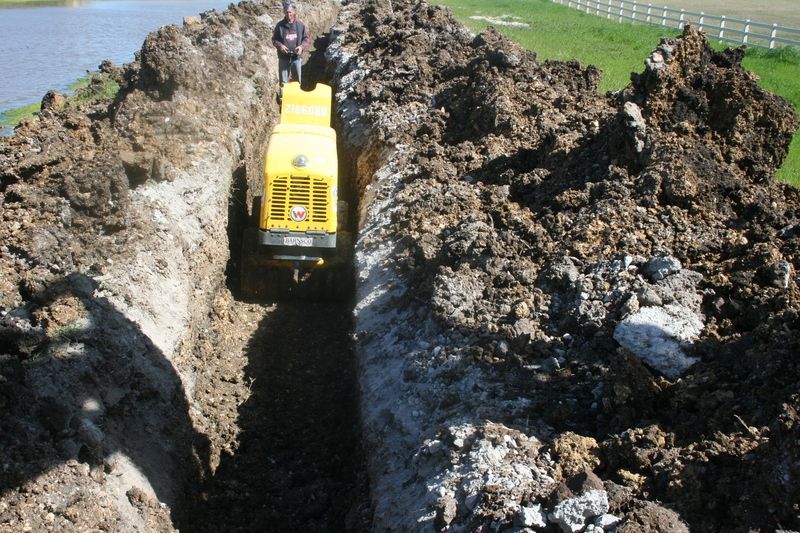 Dirt was taken out, and stockpiled along the backside of the trench. Then big bags of bentonite were dumped in and mixed with dirt that just came out of the hole. Important people on this job were the man in the seat of the track-hoe, and the people who carried 80-pound sacks to the trench—spreading, mixing, packing, and then spreading, mixing and packing again. Rain will be needed to test this process, but it will sure be better than it was before. The amount of time and money needed was a lot less than if the front slope of the dam was reworked, bentonite added, and processed. Trenching will not work everywhere, but it can now be put on the list of tools used to help with the problem of escaping water. Reprinted with permission of Pond Boss magazine, July-August 2016. www.pondboss.com. This entry was posted on Tuesday, August 7th, 2018 at 2:15 pm	and is filed under Articles. You can follow any responses to this entry through the RSS 2.0 feed. Responses are currently closed, but you can trackback from your own site.